There is something truly magical about creating, about making things. It makes me feel like a conjurer, summoning up an object from an idea. Of course between the inspiration and the manifestations can be ages of what is sometimes fun and sometimes grueling work. This one of a kind book took 14 months to complete. 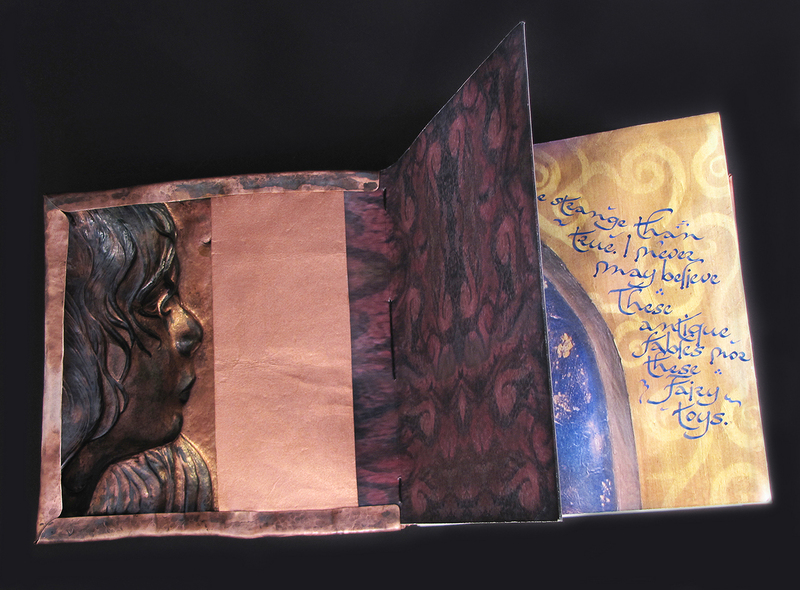 It encompasses perhaps my most involved Eastern repousse piece to date, the copper front cover portrait of my son, Skyler at age 11. I first drew the portrait with Prismacolor pencils on goatskin vellum. Before it was complete I knew had to hammer it in metal and create something intimate and interactive, a view to his thoughts on the inside via my perspective from the outside. Skyler had recently become a Shakespeare fan (no one does bawdy humor like The Bard), so I began researching passages that would fit my perspective of his thoughts and dreams as he stood on the edge of childhood, looking toward his teens. When I found Theseus’ speech from Midsummer Nights Dream, I knew it was perfect even if I did rip it out of context just a bit. The text was taken from the 1600 First Folio held by the Bodleian Library with contemporary English spelling applied. The breaking of the lines into this layout was inspired by the Bard but was, alas, subject to the whims of the artist. The calligraphic lettering is a broad edged hand that I began developing in 2012 and is inspired by a particular style of Arabic writing from antiquity. The images in the book block behind the hand lettering are original collages and drawings and a few NASA photos that I digitally manipulated into giclee prints to form a continuous set of pages. The Eastern repousse process on the copper front cover involves free hand hammering 24 gauge sheet metal alternately from the front and back with specialized tools. Eastern repousse dates back to the ancient Egyptians (such as Tutankhamun’s mask) and is a technique I’ve revived for contemporary use in jewelry and functional objects. The greatest challenge of the book was bringing together these rather disparate elements of Eastern repousse portraiture, timeless language, surreal images, and cryptic lettering to create a sense of visual depth worthy of Shakespeare’s text and equal to the literal technical height of the Eastern repousse. Together these elements of depth reflect my fathomless love for my son as I watch awestruck, his metamorphosis from child to teen to adult.